R.A. Dickey was having a miserable time with his control. Then the man of faith began to question God’s. It was the first and only major-league start of the 2006 season for Dickey, and the Texas Rangers were hoping he was about to resurrect his career with a new pitch. His transformation to full-time knuckleball pitcher still was a work in progress, however, and the Detroit Tigers pounced on him. Brandon Inge set the tone by depositing the second pitch of the game into the left-field stands. By the time manager Buck Showalter signaled to the bullpen with one out in the fourth inning, Dickey had been tagged for six home runs—matching the most allowed by a big-league pitcher since Charlie Sweeney of the St. Louis Maroons coughed up seven to the Detroit Wolverines in 1886. In 2005, Dickey’s velocity and overall effectiveness as a conventional pitcher were waning (he was 30 years old then, and had debuted with Texas in 2001) when Showalter and pitching coach Orel Hershiser urged him to try his hand at the knuckler in the minor leagues. 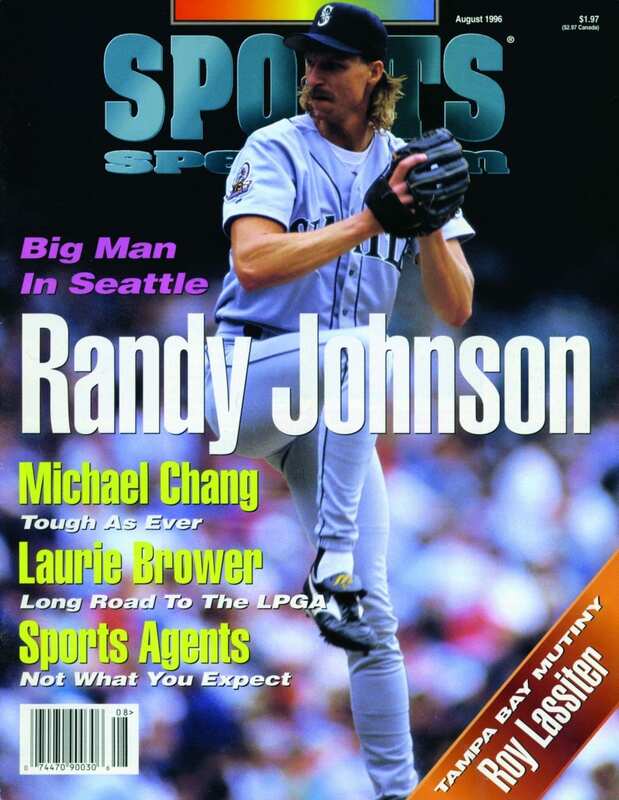 His premature return to the majors caused the experiment to blow up in their faces. For decades, Dickey had kept hidden the unspeakable pain he suffered as a child victim of repeated incidents of sexual abuse by a female babysitter and on another occasion by a male teen. Finally, he was moved to share with the world those dark secrets and other disturbing episodes—to include broken relationships with his parents, his own marital infidelity, suicidal thoughts and more—in his gripping memoir, Wherever I Wind Up: My Quest for Truth, Authenticity and the Perfect Knuckleball. The task became another ordeal. 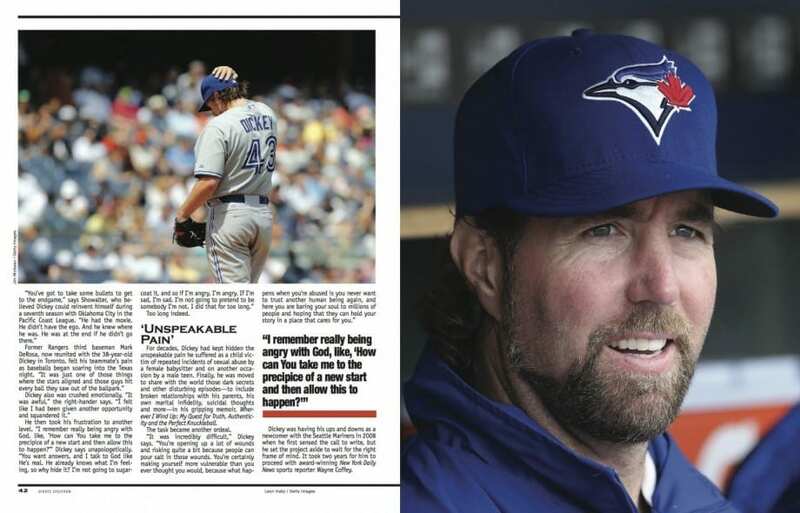 Dickey was having his ups and downs as a newcomer with the Seattle Mariners in 2008 when he first sensed the call to write, but he set the project aside to wait for the right frame of mind. 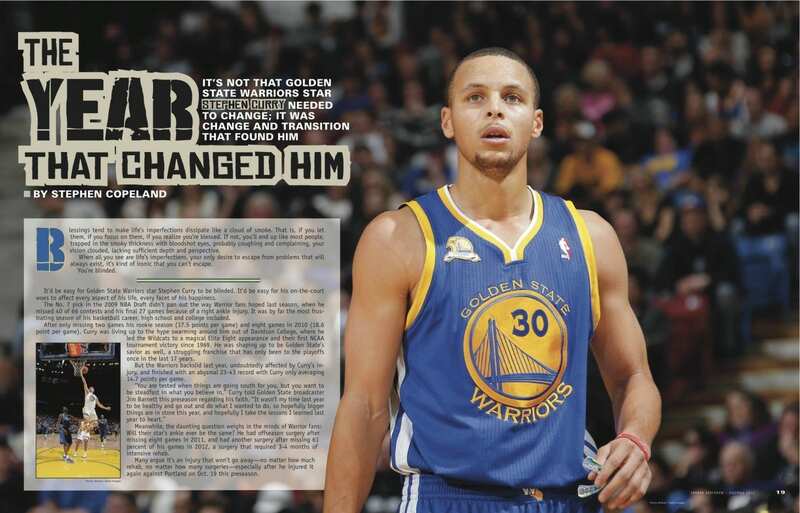 It took two years for him to proceed with award-winning New York Daily News sports reporter Wayne Coffey. 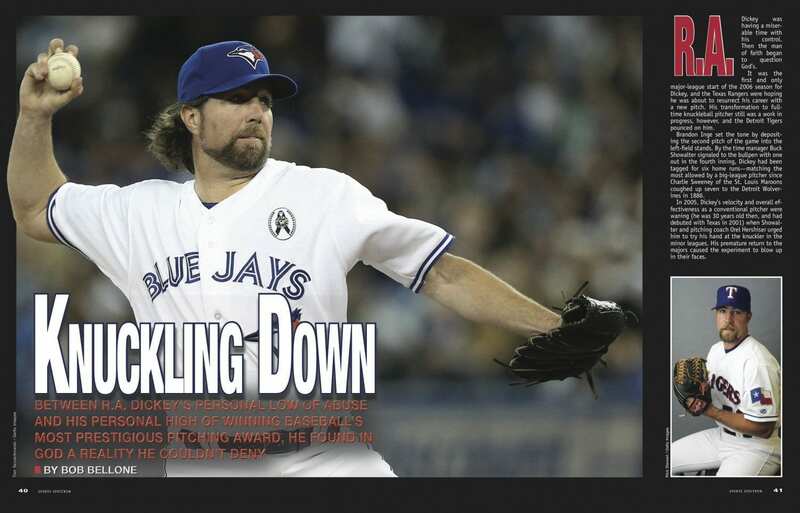 Also unforeseen was the height of Dickey’s rebound from rock bottom. In 2010, the journeyman began a solid three-year stint with the New York Mets after bouncing back and forth between the major leagues and minor leagues, where he spent the 2009 season with Minnesota and Class AAA Rochester, the 2008 season with Seattle and Class AAA Tacoma (2008), and the entire 2007 season with Class AAA Nashville. But that was normal for Dickey, who started in the minors in 1997 after playing collegiately at Tennessee and had spent parts of every season in the minors (through 2010) after debuting with Texas in 2001. He wrapped up his three-year stint with the Mets in grand fashion by winning the National League Cy Young Award last season. During a stretch of five consecutive outings of at least seven innings without allowing an earned run, Dickey posted back-to-back one-hitters. 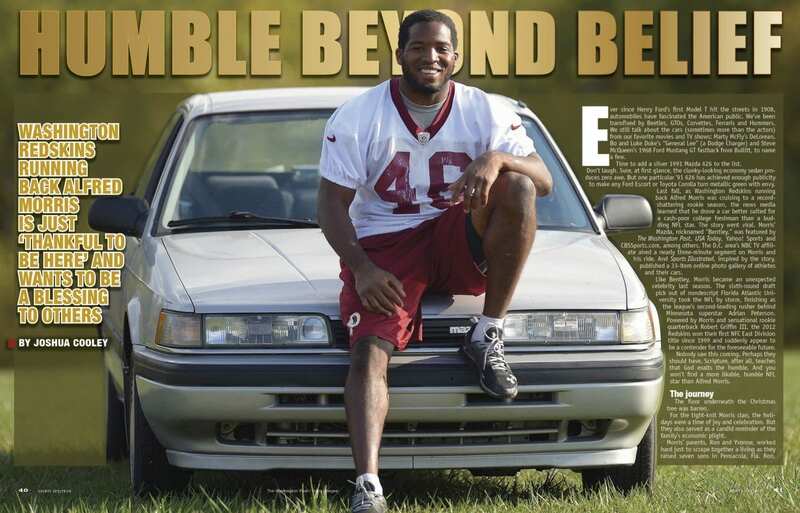 The second gem came at the expense of the Showalter-led Baltimore Orioles. 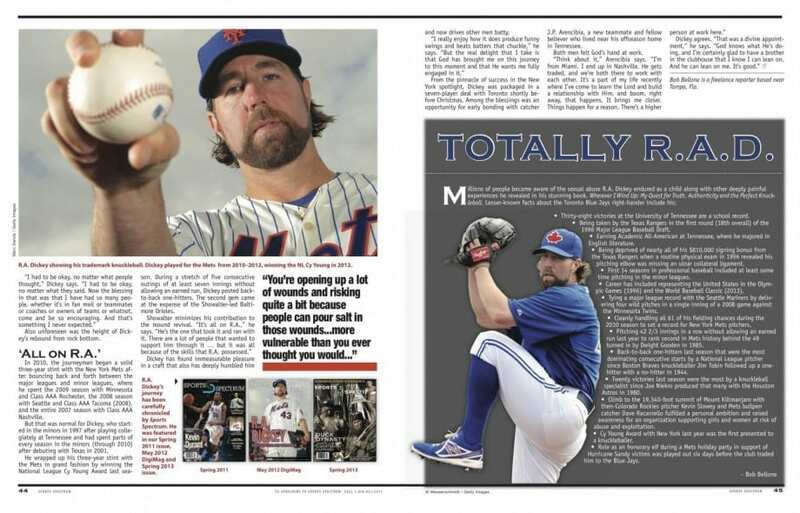 Dickey has found immeasurable pleasure in a craft that also has deeply humbled him and now drives other men batty. From the pinnacle of success in the New York spotlight, Dickey was packaged in a seven-player deal with Toronto shortly before Christmas. Among the blessings was an opportunity for early bonding with catcher J.P. Arencibia, a new teammate and fellow believer who lived near his offseason home in Tennessee. Both men felt God’s hand at work. Bob Bellone is a freelance reporter based near Tampa, Fla.